Help comes in the shape of a memory card. According to sister site Kotaku Japan, a handful of PlayStation Vita games can save onto the game cards directly. Some games will need a memory card for game saves, meaning that so will you. Kotaku Japan received the following information from Sony Computer Entertainment. 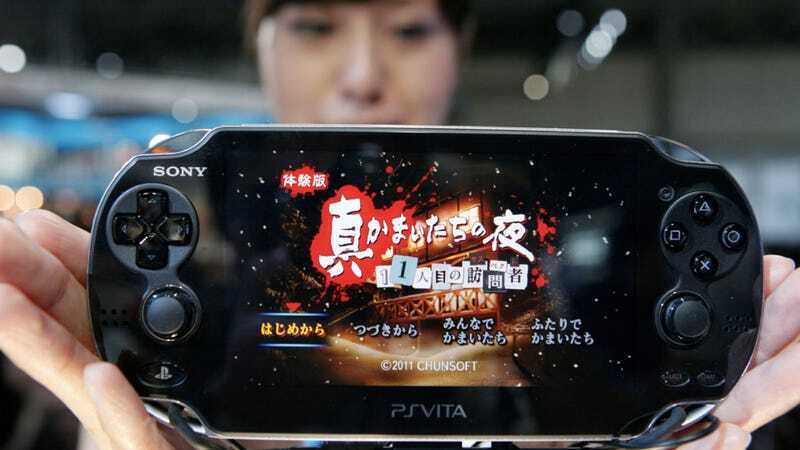 To data, the games that can save data onto the Vita game card include Asphalt: Injection, Ultimate Marvel vs. Capcom 3, F1 2011, Dynasty Warriors Musou Next, Shin Kamaitachi no Yoru, Dark Quest, Shinobodo 2, Power Smash 3, BlazBlue Continuum Shift Extend, The Michael Jackson Experience, Mah-Jong Fight Club, Let's Try Bass Fishing: Fish On Next, and Lord of Apocalypse. The games that require a memory card for saves include @field, Uncharted: Golden Abyss, Dream Club Zero, Disgaea 3, Hot Shots Golf 6, Monster Raider, and Ridge Racer. It's still TBA whether Katamari Damacy: No・Bi~ta will need a memory card for game saves or not. At the PS Vita's December 17 launch, the following memory cards will be available: 4GB memory card (¥2,200 or US$29), 8GB memory card (¥3,200 or $42), 16GB memory card (¥5,500 or $72), and 32GB memory card (¥9,500 or $124).